Running two private schools must have been difficult in the straitened times of the 1930s, although the closure of Ashburton Grammar School in 1938 probably gave the headmaster reason to hope that the numbers of boys at the Wilderness would increase as a result. But a year later war was declared, and this would have added to the challenges of attracting pupils to the schools. But first there were practical difficulties to be overcome - Greylands does not seem to have been at all ready. 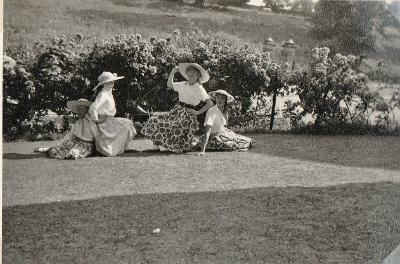 'Csvdevon', on the BBC website of people's wartime reminiscences, recalls 'I remember in 1939, when I was 16 and at a girls' boarding school, called Greylands, in Ashburton. It was a very small school with about 70 pupils of which 25 were boarders. It was a large house with about 3 other girls in my dormitory. As the war started drawing to a close, so did Henry Naylor's enterprises – at least as far as Ashburton was concerned. 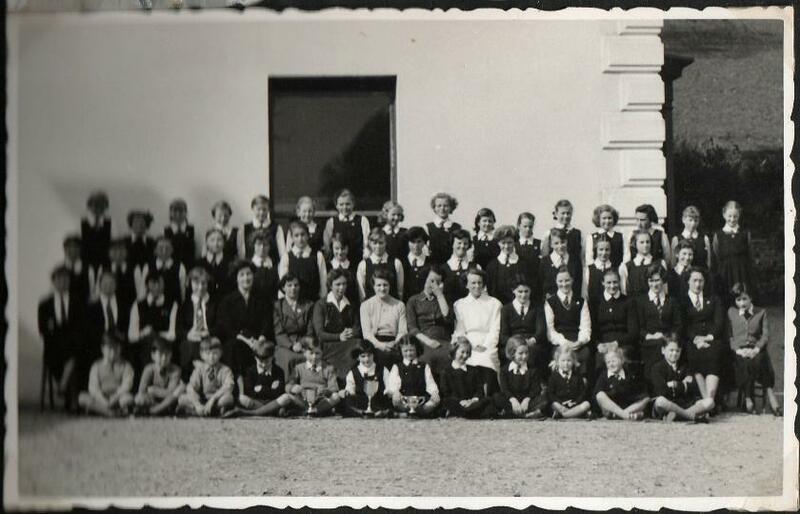 By 1944 the girls' school was at Coombeinteignhead: the boys' preparatory department either moved at the same time, or shortly afterwards. Miss Mary S Pim moved with the school to its new home. 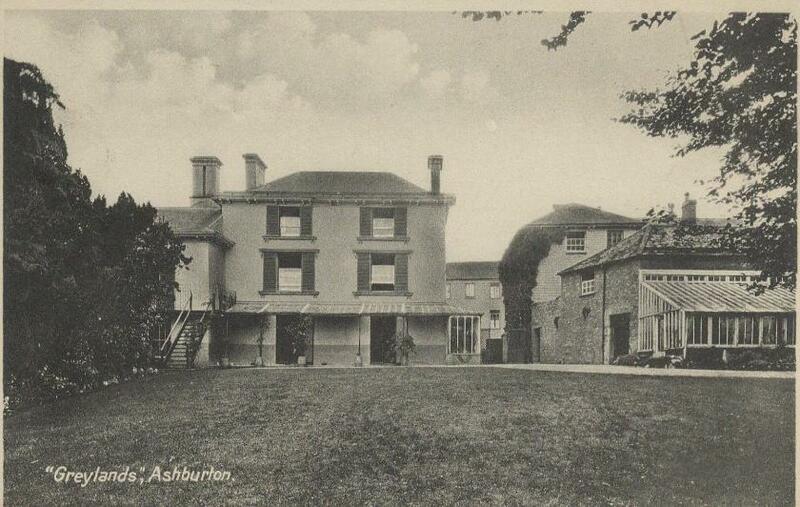 By the end of the following year Ashburton College was at Highwood, Newton Abbot. The reasons for the move were probably financial – Heather Woodley recalls that numbers were dwindling at the time. Newton Abbot provided a larger catchment of local pupils, and better transport links for those pupils who travelled to the school – either daily, or as boarders. 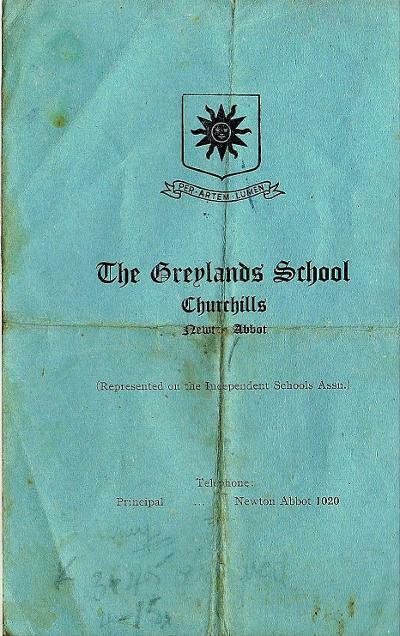 By March 1947 Miss M S Pim was the principal of Greylands School, Churchills, Newton Abbot. 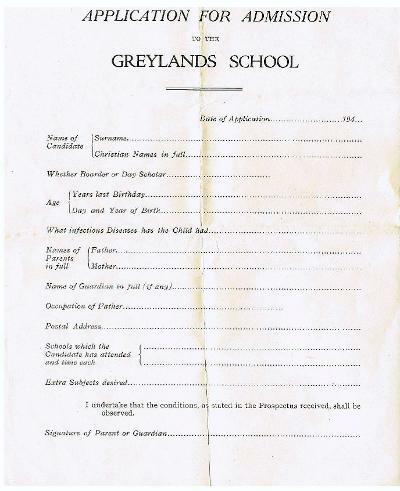 Above: Admission form for Greylands, Newton Abbot. Right and below: A booklet about the school. 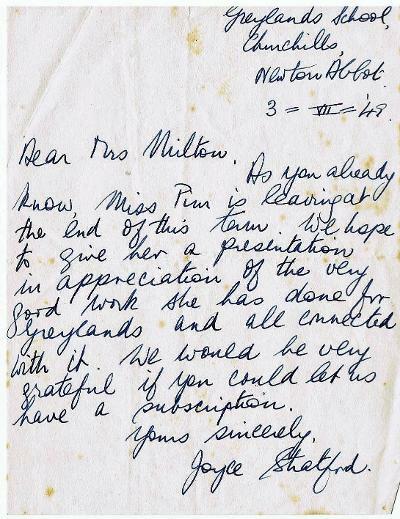 Below: Two letters to Mrs Milton in 1949. 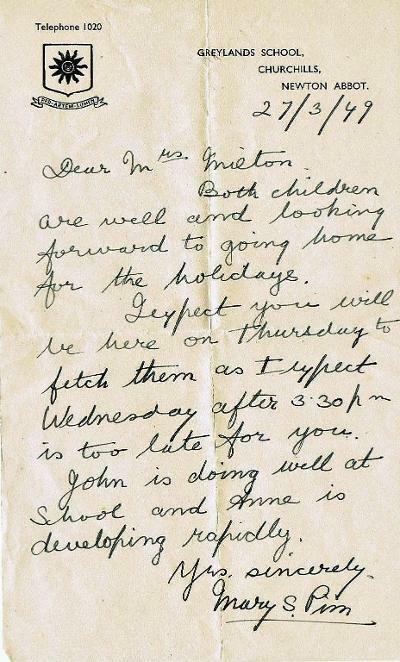 The first deals with collecting the children for the school holidays; the second is seeking a subsciption for a gift for Miss Pim, who was leaving at the end of the summer term. With thanks to John Milton. Mrs Clare Wilson MA Hons, Manchetser, was the headmistress in October 1949. By the mid 1950s a Mr N A and Mrs Callender were running the school. The most likely candidate for Mr Callender is Norman Alexander Callender, born in Edinburgh and living with his widowed mother Jessie in Brighton at the time of the 1911 census. As Henry Naylor taught at Steyning from 1906-1909 and from 1912-1918 it is possible, if Norman attended Steyning Grammar School, that Henry Naylor taught him. By 1939 a Norman A Callender was teaching at Eton; on the 1939 register his date of birth is given as November 14th, 1904. The death of Norman Alexander Callender, born Nov 14th 1904, was registered in Bideford in the first quarter of 1991. Henry Naylor sold 83 East Street (ie Ireland House) to a John D Gregory in 1945 (Conveyance 1945, National Archives http://www.nationalarchives.gov.uk/a2a) for £1790. 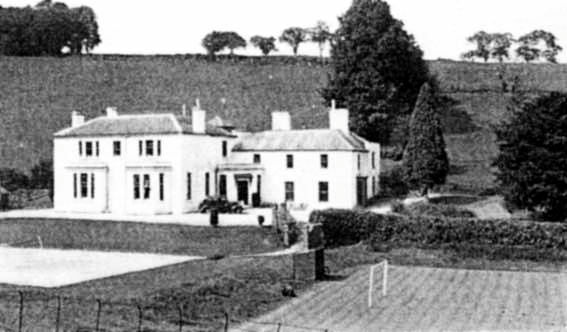 A number of people remember Buckfast Abbey owning the Wilderness, and it seems likely that Henry sold this property directly to them at about the same time. He was still involved with Ashburton College at Newton Abbot, in the role of Bursar, by the end of 1950 (Western Morning News 27 December 1950 p4 col 4) - he was then 70 years old. In June 1941 a special Devon 'Spitfire Day' at Ashburton raised £27. 10s, of which schools in town raised over £6. The schools involved were: Ashburton College, Ashburton Council Schools, Greylands High School, St. Faith's School, (which was in the Golden Lion - see The pubs and inns of Ashburton, Pete Webb, Obelisk Publications 1995, p 26) and the Wilderness Roman Catholic Evacuees' School. (6 Jun 1941 Western Times p3 col 5). What was the Evacuees' School ? 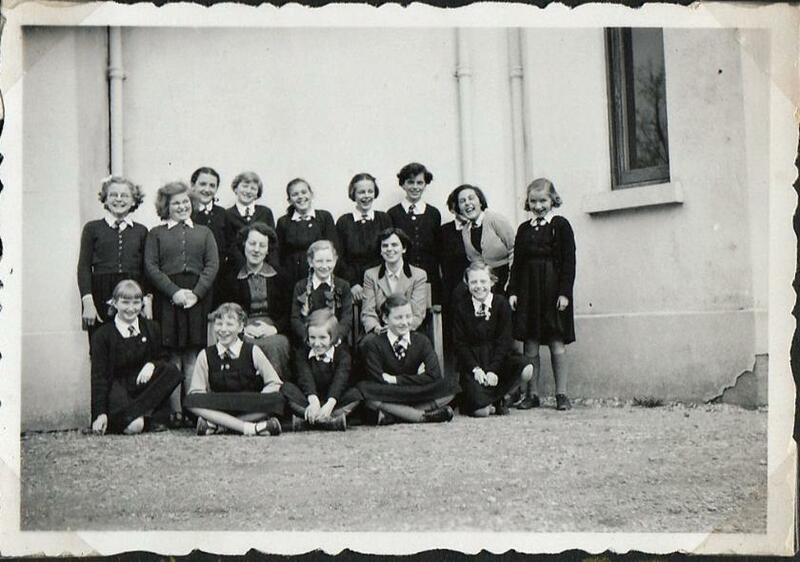 121 evacuees arrived in November 1939, from St Patrick's LCC (R.C) school in London. 30 went to Buckfast and were educated at school there: the rest were billeted in Ashburton, and attended The Wilderness School. This was by arrangement between Devon County Education Committee and the Roman Catholic authorities at Buckfast Abbey (24 Nov 1939 Western Times p9 col 3). 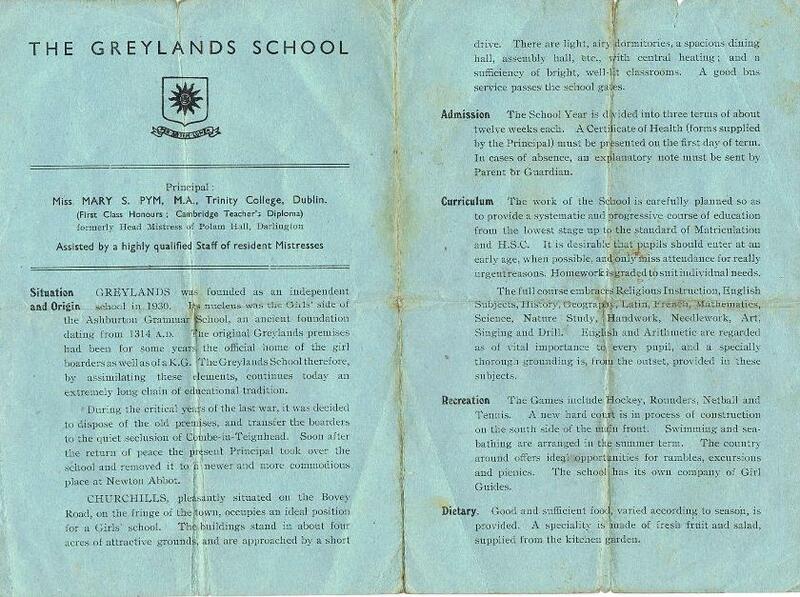 Wendy Major remembers the Wilderness evacuees, in their blue and grey uniforms, being taught in Ireland House. 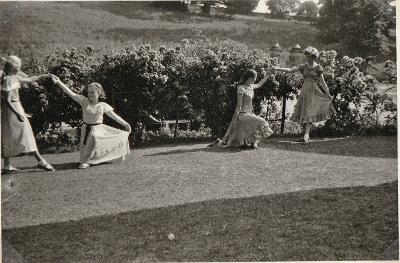 In January 1942 there was a tea and social at The Wilderness for about 30 London women. Assisting at the tea was Mrs T Tubridy, the official LCC helper, the teachers of the Roman Catholic School, and Mrs J C Rosewarne, who had made and presented "a fine iced Christmas cake, which was greatly appreciated". When Greylands moved to Coombeinteignhead, Heather Woodley stayed with the Ashburton School for about a year. Nuns, possibly from Totnes, ran it for a short while - they brought some pupils with them. Heather remembers that she had to call the headmistress The Good Mother, and she also recalls that there was Mother St. Patrick and Mother Theresa, the latter teaching music. There were prayers every morning, but pupils were excused if they were not Roman Catholic. Hilary Beard recalls that the school was then called Les Filles de la Croix, and also remembers The Good Mother, who reassured her when she was worried about making a mistake with a drawing. 'You will make mistakes throughout your life' the Headmistress said, 'it is nothing to worry about'. The school was very keen on poetry recitations, and Shakespeare: 'We did Julius Caesar so often that Rosemary Davies could recite the whole play by heart'. Moyra Babbington taught drama at the school, which won prizes at an arts festival held in Paignton. Not everyone had happy memories of the nuns.